The practice and composition of music require patronage and institutional support, and they require it in a different fashion from that found in other forms of art. 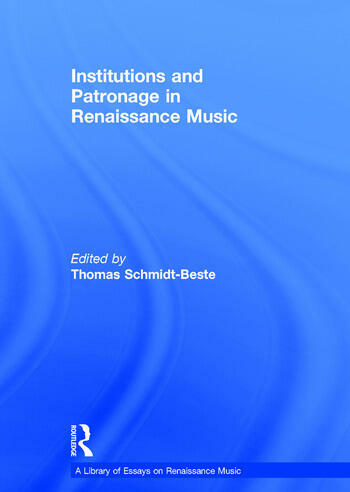 This collection of essays brings together the most recent and important contributions by leading scholars in the field to this crucial aspect of Renaissance musical culture. The articles approach the topic from a number of perspectives and consider the institutions and individuals engaged in supporting music; the systems of employment, benefices and sponsorship put in place to facilitate the support; and where, how and why music was sung and played. Taken together, these articles enable conclusions to be drawn about the interests of patrons and about the social and artistic status of musicians and composers within the courtly and urban context. Contents: Introduction; Part I Systems of Institutional and Individual Patronage: Anmerkungen zur 'Benefizialkarriere' des Johannes Ockeghem, Adalbert Roth; The education of choristers in England during the 16th century, Jane Flynn; Renaissance women as patrons of the music: the North-Italian courts, William F. Prizer; Patronage and innovation in instrumental music in the 15th century, Keith Polk. Part II Courts and Chapels: Composers at church and court in 15th-century Brussels, Barbara Haggh; The internationalization of the Italian papal chapels in the early quattrocento, John NÃ¡das; La musica, la cappelle e il ceremoniale alla corte aragonese di Napoli, Gianluca d'Agostino; Ritual and regulations: the organization of the Castilian royal chapel during the reign of the Catholic Monarchs, Tess Knighton; Der 'tÃ¤gliche Dienst' der MÃ¼nchner Hofkapelle im 16. Jahrhundert, Franz KÃ¶rndle; Music and patronage at the court of Rudolf II, Robert Lindell. Part III Churches, Orders, Guilds, Confraternities: Change and continuity in the Reformation period: church music in north German towns, 1500-1600, Joachim Kremer; Le pratiche della musica nelle chiese e nelle confraternite di Roma nel cinquecento, Noel O'Regan; Far una bella procession: music and ceremony at the Venetian scuole grandi, Jonathan E. Glixon. Part IV Composers: Protector, imo versus pater: Francesco Zabarella's patronage of Johannes Ciconia, Anne Hallmark; After Burgundy: rethinking Binchois's years in Soignies, Sean Gallagher; Zur sozialen Stellung europÃ¤ischer Renaissance-Musiker am Bespiel Orlando di Lassos, Horst Leuchtmann. Part V Spaces: Spaces for court music, José Manuel Barbeito; Magnificence as civic image: music and ceremonial space in early modern Venice, Iain Fenlon; Name index.